If you suffer from gout, one of the simplest and most effective home remedies you can use is to make a basic black bean broth. Sipping the bean broth regularly can restore needed nutrients and help to limit the build-up of uric acid in the body. That crystallized uric acid is what builds up between the joints and causes your gout pain. Black bean broth is a traditional Taiwanese home remedy for gout, one that has quickly been taken up throughout the world as people recognize the curative properties of this natural remedy. 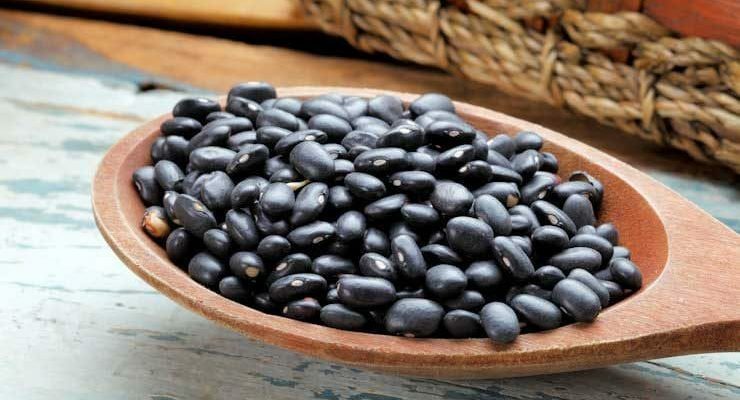 The specific kind of black beans does not seem to be critical, as all such dark beans are rich in anthocyanins, phytochemicals that for many people quickly reduce gout pain and inflammation. Add half a pound of dry black beans to two quarts of water and boil for 1-2 hours. Afterwards, drain the liquid into a container and discard the beans. Drink about a cup of broth each day at the outset of a gout attack. Then drink it each day until the pain is gone. Thereafter, at least once a week to prevent gout pain. Continue reading to learn how well this broth worked for our readers! When boiling the black soya beans for gout, please take care not to boil to the point where the skin of the beans tear. By exposing the beans inside, you can make the uric acid content higher when you drink the soup. In the past, I've successfully used celery seeds and lots of water to treat my gout. One cup of the black bean broth seems to be effective as well. 1 cup of beans, 2 cups water and seasoning. Cook in an instant pot for 30 minutes. I have been suffering from joint and muscle pain since I developed the Shingles last June. Worked with my Chiropractor, with some relief, he also had me taking ACV. Came across the black bean juice last week and thought I’d give it a try, beans were cheap enough. WoW! Do I feel great for the first time in months. I’ve been drinking it for just 6 days now and I’m hooked. I have severe arthritis in both knees and have a referral to see a specialist. Can’t wait to tell him about this. I have personally used Black Beans to cure/relief my gout pains and with fantastic results, which are fast and long lasting. I have also recommended it to relatives who suffered from severe gout pains. Those who tried it can attest to its efficacy. Nonetheless, we must also be mindful of taking less of those purine rich food that cause gout. Many people may have resevations about black beans because bean are know to cause gout. It is the skin or hull of the black beans which contains a very high level of anthocyanins that is effective in ridding gout pains. As I am writing this, I have just cured myself of a bout of gout attack which recurred because I did not have gout pain for a long time and I simple became complacent and indulged myself in lots of red meat and purine rich food. After taking black bean broth the pain went off as fast as it came – like magic!. the skin of black beans are loaded with antioxidant compounds, which when taken regularly have also been shown to offer protection against heart disease, cancer and aging. I love your site. Bless you for having it. After reading just about all the suggestions I have been eating blackbeans that I cook from dry and freeze in small containers about a cup or so. Whenever I feel a gout attack coming on I just thaw out a small amount and eat. I don’t even put anything in the blackbeans like seasoning or stuff. It seems to work for me.It is kinda amazing. I also have been doing the ACV and also the pectin capsules (and they are cheap). All these things I learned from your site. It has been about 8 months now since I stumbled upon your site. I thank you sooo much. I hope this will help someone else. I also stay away from certain foods- I have an inkling it might be mercury that activates it so I do not eat anything with spirillina which is in a lot of health foods, I think it caused one of the worst flare ups I ever had, and tuna, salmon or other fish that might contain mercury. I do eat fish though like trout, catfish and yes oysters. And I drink coffee like crazy but only black coffee. I do one thing that I haven’t read on your site and that is vitimins from New Chapter called Zyflamend-they are kinda expensive-$22 or so and I’ll only take them when I feel an attack coming on. They may or may not help because it might be the ACV, pectin capsules (3-6 a day) and my blackbeans that are working. I am just making sure that if they are working I do not want to not take them. I eat cherrys but don’t really seem to benefit from them. Can I thank you one more time for your website. Thanks and I would like to thank the wonderful person that wrote about the blackbeans. Black beans works very well for me!! I had been suffering from heal pains, toe pains for a few years and had seen doctors who prescribed painkillers which provided only temporary relief for the pain. They were telling me I was suffering from “bunion”, “bursitis”, etc…. I was referred to specialists but my “pains” still persisted. In fact, the pains came on more frequently – perhaps due to my diet. I was desperate!!! Then it dawned on me to find out more about my ailment from the internet. I am glad I did because I have found something that can hold my “pains” at bay, and it really works like wonders! It is through this Earth Clinic website that I discovered “Black Beans”. I started taking black bean broth as described and I was amazed that the pain was gone the next few days. From then onwards I have been taking black bean broth regularly. At the same time I am still enjoying my food – including my favourite food , such as red meat, and many other purine rich food , which I realised were the main causes of my gout problems. Lately, I did a test on myself to affirm the efficacy of black beans on gout. I did it because beans are known to cause gout, and yet black beans are doing the opposite. As usual, I continued with my regular intake of red meat and other “rich” food, but I stopped taking black bean broth. After a week or so, I began to feel my gout pains coming on – slowly but surely. Finally, I started feeling the pain on one of my toes and it got worse very quickly. The toe then became red and swollen and I had difficulty walking. Immediately, I prepared black bean broth and drank it. The first day after taking the bb broth I could feel that the pain did not get worse. I continued taking the broth the next day – the pain was less and the swelling on my toe was subsiding. On the third day, I could walk normally as the pain was gone. I am a very happy person now as I can still enjoy my favourite food and not need to worry too much about gout pains anymore. Of course, I must also be mindful of my other aspects of personal health and well-being, so I am making a conscious effort to reduce my intake of “sinful” food and eat in moderation. Hi, Firstly I wanted to express my gratitude for this website, it’s fantastic! I just discovered it and am eagerly trying many of the remedies for weight loss and my father’s gout. I was excited to read the information about the black bean ‘juice’ and quickly made a batch for my father as he has been suffering from gout on and off for about 2 months. The day after I made the concoction, he came down with gout. We promptly tried the remedy, infact I had him drink 2 glasses, and unfortunately today it has worsened and swelled up. I feel terrible. Reading about ACV, I will TRY to get him to take some w/ honey – unfortunately I think that his trust in me has probably deteriorated – rightly so I guess. But I’ll keep you posted. Also, can you give me any other information as to what foods may cause gout, I’ve checked so many websites and composed a list for my father – who is avoiding the foods as best as he can, but the gout still comes back on the weekly basis. Hi there, I just read about your fathers gout getting worse after taking black bean broth or soup. That could be due to the fact that black bean contains anthocyanins which also contain flavonoids. When the body breaks down flavonoids it produces uric acid. This is the enemy of gout. Hi I would like to know about the black beans. Is it black soy bean or just black color beans? I get really severe gout attacks sometimes, usually in my knees, but at times I can even feel the uric acid crystals forming in my finger joints, wrists or elbows! I know that cherry juice, blueberry juice, pomegranate juice, etc (which all contain anthocyanins) can eliminate uric acid from the blood and is much more effective than colchicine which merely stops the production of more uric acid in the liver. But colchicine is also very damaging to the liver, and liver damage is the origin of gout in the first place in many people (or kidney damage in others). After moving here to Taiwan, the manager of a school I was teaching in informed me about black bean broth. Unlike the various juices mentioned above, black beans are CHEAP and are easy to find in local markets and to keep around the house. A close look at the black bean broth shows that the black color is really a dark red. Yes, black beans contain anthocyanins, that group of pigments which range in color from blue to red to almost black. In an emergency, you throw a cup of black beans in a pot of water and boil it and as soon as the water color turns dark, you can get some broth, cool it and drink it. This remedy takes only a few hours to eliminate the crystals from the joints, but the damage to the joints may take up to two days to heal. It is good to prepare some of this amazing healing remedy and freeze it in case of a sudden gout attack. P.S. I never heard of it before living here. I assume that it is due to anthocyanins. (The red color seems to support that idea.) But, boy, it really works. While I am waiting for it to take effect, I just began using 55% DMSO topically to take away the pain, which helps a bit. But, with black bean broth, it really removes the uric acid from the blood in about 2 to 4 hours. I would be interested to know the exact meaurements for the black bean broth. If anyone knows, please contact me. Guys beware! The so called “black beans” found in Asia are not the same that you can buy in your grocery store in America. In Asia what is called “black bean” is basically a variety of soybean with a dark skin. The asian “black bean” belongs to the genus glycine, the one commonly found in America belongs to the genus phaseolus. This not the same thing! You are so right about black beans! I do a blog about healthy, low cal/carb/fat dieting program I call the Fairy Tale Diet (that is not for sell, just read the blog and learn how it has helped us lose a lot of weight) and today I posted a super simple recipe for Black Bean Brownies. My DH loves their taste even more than regular brownies, even after he found out they were made with black beans! He had a 2 inch wide by 1 inch high gout flair up on his big toe until he started eating these brownies every weekend for a year… Now it’s gone. The pain stopped with the first batch. Try them out… I publish 5 free recipes a week and have no products for sale. This recipe is at the bottom of a blog titled: Become a Picky Eater at GrannysGourmetDIY.wordpress.com. I hope you will love them too! I heard about the black bean broth and gave it a try. It appears to work for me, but a friend didn’t have any positive results. I mix 1/2 lb. Black beans in 2 quarts of water. I add a small amount of ginger (buy it bulk for not much cost) to the help with the taste. I slow boil it for 90 minutes, then I strain the liquid into another container. Throw the beans away, we tried to salvage them, no luck. When the broth cools to room temp. I pour it into a 16 oz glass and drink it. Leave the bottom inch as it is thick. I do this once a week and have had success controlling the gout. It was 10:30 p.m. when I read your posts about black bean broth for gout. My husband has been suffering (and I DO mean suffering! ) with gout for 11 weeks in his hands, wrists and elbows. He has been a vegetarian for 4 weeks now. He has been on cherry juice, cherry juice concentrate, cherry pills, a liver cleanse, a ginger/turmeric/local honey mixture and alkaline water (9. 5). I ran to the store in my pajamas and grabbed a bag of black beans. I am in the process of cooking them now at 11:30 p. m. Then I read that the black beans in America aren’t the same black beans in Taiwan. Does that mean that the black beans I just bought aren’t going to work for him. I’m going to make him drink the juice anyway, but will check back for your answer. Thanks! Guaifenisin is an old, old gout remedy. It is the exact chemical composition as the original tree bark extract. It pulls lactic acid out of the cells, to relieve the pain, if it is in fact gout. This worked wonders for me with fibromyalgia as well. As with so many wonderful healing agents, I have heard it is being pulled off the market. Does the job too well! I do not know what tree was originally used, but I’m sure it could be found. –T. Amazing! Thank you for posting. I have been in misery for months with chronic gout. Bought some beans Monday afternoon, drank some broth and within a couple hours my right leg is feeling real relief! I never dreamed that relief could come that fast from something so simple. I feel better today than I have in months. Gout and the side effects of the prescription medicine made me feel lousy. I could ever say now that black bean broth is good for depression, LOL. Again thanks for you folks posting.